Rosette about 5 inches diameter. Thin waxy leaves with serrated, dark red edges. Leaf backs are almost entirely reddish-purple.. I got this "mother" Echeveria from a friend as a stalk cutting. Each winter it forms a ring of offshoots around the stalk just under the main rosette that I pop off and plant. I ran out of pots so I left two of the "babies" on the stalk. It blooms in winter, but for the life of me i can't remember what color the flowers are. I want to say white or a peachy orange. It's in a tall pot outside. I live in a warm area that rarely frosts and it gets strong direct sunlight most of the day. I'm pretty sure this isn't an Echeveria - happily, it's even better! It's most likely an Aeonium, which are in my opinion, nicer than most other tender succulents. 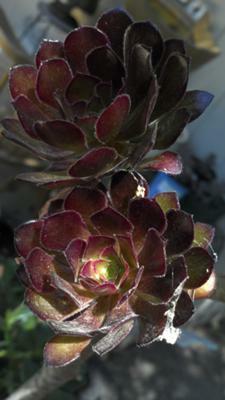 You can find out more about them here: Aeonium. They are commonly mistaken for Echeveria, but they have a couple of important differences. You'll have to pay attention to the form of the flower when it blooms - if it's an Echeveria, it will be a flexible stalk that bends over and has little dangly bells in orange, peach or pink (usually) and the rosette doesn't die. Aeonium have a tall spike of usually yellow flowers clustered at the top, and the mother rosette dies off once it's finished flowering. Whichever it is, it's gorgeous, and well worth keeping it going just the way you describe. 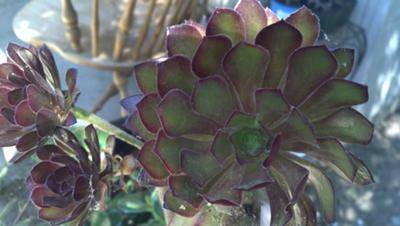 You have the perfect climate for both Echeveria and Aeonium, especially the frost free, warm and bright.